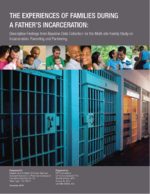 Using data from baseline interviews, this report describes the experiences of 1,482 incarcerated fathers and their intimate or coparenting female partners. One key contribution of this report is that responses reflect the dual perspectives of both men and their partners, thereby providing the most detailed portrait to date of couples who are in intimate or coparenting relationships during a period of incarceration. Survey questions addressed relationship quality, parenting and coparenting, family contact, and the well-being of children and mothers during the fathers’ incarcerations. Specifically, sample members were asked about work and family lives prior to incarceration; their health and well-being during the fathers’ incarcerations; and their expectations for reentry, including reunification with each other and their child or children. Detailed information about a single “focal child” for each father was also collected. Findings from subsequent interview waves at 9, 18, and (for a subset of sites) 34 months after the baseline interview will provide information on later experiences, including reentry, family reunification, and factors associated with desistance.